When I am sitting in my room in an autumn evening reading the Klimazwiebel and decide to switch on the heating, will the heating will have any effect whatsoever on the room temperature ? After a little thought, I conclude: 'no, since temperatures the yesterday at midday were higher than as the temperature measured after switching on the heating. Thus the observed temperature rise in the room could have had natural causes'. This reasoning has obviously been constructed to reveal the contradiction of focusing on the level of past temperatures, for instance during the Medieval Warm period or during the Holocene, to demonstrate or refute the possible effect of CO2 on the temperatures today. Many bloggers seem to think that if the Medieval Warm Period was warmer than today, it would rule out any effect of anthropogenic CO2. This is, as the example above illustrates, absurd. Yes, our dear sceptics will retort that the 'hockey team' and in general the IPCC reports have tried to portray the relative levels of temperatures in the Medieval Warm Period relative to today as a proof of the anthropogenic greenhouse effect. This is and was incorrect as well. Scepsis etymologically means 'investigation' and thus a true sceptic would be rather interested in being informed and not so much in scoring political points against the adversary. The effect of anthropogenic CO2 can only be ascertained by comparing two situations that only differ in their CO2concentrations, but which are otherwise equal. The Mediaeval Warm period and today are two moments with different CO2 concentrations, but many other factors could have been different as well. For instance, it is not known whether solar irradiance was lower or higher, or whether volcanism was stronger or more frequent. A direct comparison and a conclusion about the effects of CO2 is thus not possible. It would be possible if we could quantify, and then factor out, the effect of all these other forcings. But this is unfortunately not yet possible. This rather long preface is related to the recent paper by Esper and colleagues. It shows that summer temperatures in Northern Scandinavia display a long-term cooling trend at millennial timescales over the last 2000 years. This was derived from the density of tree wood and from simulations with climate models. Before going into the parts of the papers that I personally find more interesting -allow me another detour. Quite a few blogs have too quickly re-interpreted this seasonal and regional temperature reconstruction as a global annual temperature record, erroneously claiming that global temperatures are declining, even during the last decades. It is a wild extrapolation to believe that Scandinavian summer temperatures are indicative of global annual temperatures. Additionally, long-term millennial trends are one thing. Another quite different thing are the shorter warm and cold excursions around this trend, as for instance the 20th century warming, which have completely different causes. A true sceptic, again, would intermediately point to those wild extrapolations or involuntary errors. Fortunately, we have a lively collection of climate blogs devoted to identify all sorts of errors and pitfalls in climate science, and I am convinced that this one will also be duly exposed by the revolutionary guardians of the internet. Harking back to the Esper et al. paper... Was it warmer in summer in the Northern Hemisphere 2000 years ago than today ? Quite likely.. Was it even warmer in summer 6000 years ago ? I would say yes. Many other proxies indicate quite warm conditions in Northern summer at high latitudes. For instance, the Siberian tree line was closer to the Arctic coast than it is now. This is not really a surprise. Climate simulations driven by the different orbital configuration of that time display these higher summer temperatures. In the mid-Holocene, the perihelion, which is the point of the Earth's orbit that is closest to the sun occurred in July. Now it occurs in January. 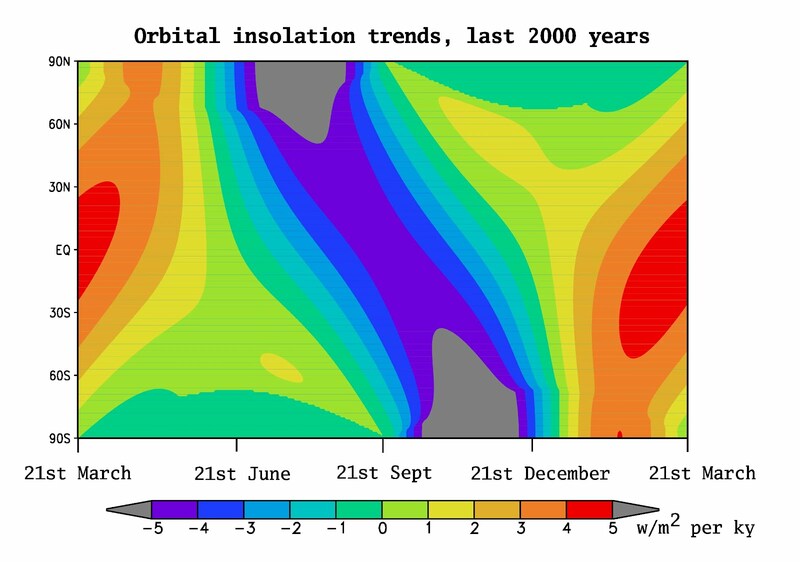 Thus, it is not very surprising that the shift of the perihelion from July to January caused summer temperatures in the Northern Hemisphere to display a cooling trend. Has this any relation to the anthropogenic greenhouse effect in the 20th century ? Nothing whatsoever. Linear trends of the solar insolation caused by slow changes in the orbit of the Earth over the last 2000 years. This spatial pattern is very different from the greenhouse gas forcing, and it obviously can cause regional and seasonal temperature trends of both signs that are much larger than the annual global mean. The global mean of this 'orbital forcing' is very close to zero. However, it does say something interesting about the impacts of warming, irrespective of what caused these higher temperatures. In a warmer Mid-Holocene 6000 years ago, when perhaps the Arctic was ice-free in the summer, polar bears obviously survived. From my perspective, and I am sure other co-author may have other points of view - an interesting part of the paper lies elsewhere. First, it was possible for the first time to identify the long-term millennial cooling trend in summer temperatures and high latitudes in tree-ring records, with a value of about 0.3 degrees per millennium- compare this value with the observed global warming trend of about 0.12 degrees per decade . Secondly, this trend is similar to that produced by climate models, although it is not equal - and two similar climate models produce also temperature trends that are roughly similar, but again not the same. To require that two climate models perfectly agree with proxy-based reconstructed temperatures would sound as a minor niggle, but in my opinion this is one of the few situations in which we should expect a close agreement if models were perfect and the reconstructed temperatures are correct. Most of the comparison between climate reconstructions and climate simulations in the Holocene have been conducted over periods in which the external forcing is uncertain, e.g. the past millennium. In these periods the calibration of low-resolution proxies in terms of temperatures, like lake sediments, is particularly difficult . In our case the dendroclimatological records were very long, the changes in the external orbital forcing can be accurately known by astronomical calculations, the target variable is a linear trend over a long period - 2000 years. It can be argued that in this situation the agreement among models and between models and reconstructions should be particularly good. Indeed, when one looks at the large scale pattern of temperature trends simulated by two climate models, they look strikingly similar: cooling at high latitudes and warming (yes, warming!) ) over the Tropics. Yet, squinting over some regions, for instance the Mediterranean, the sign of the simulate the trend is opposite, which indicates that regional feedbacks may also influence millennial trends. Also, the magnitude of the trends in some latitude bands is larger in one of the simulations. Over Scandinavia in summer, the magnitude of the reconstructed cooling trend is larger than in the simulations, which would indicate that models may be under-sensitive to changes in the external forcing (none of our internet guardians picked up this possible interpretation). However, I would not go that far, since the nature of the orbital forcing is quite different from greenhouse gas forcing. 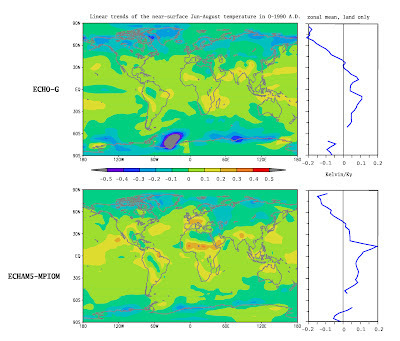 Linear trends of the summer temperature over the last 2000 years simulated by two climate models. The panels on the right display the mean trend for each latitudinal band. All in all, this paper opens a few interesting questions by extending the play field in which models and high-resolution climate reconstructions can be compared, ushering in an external forcing that is accurately known. After reading your introductory remarks about the "sceptics' position", I didn't bother finishing this article. This late in the ongoing debates, I saw that you are either incompetent or disingenuous, because you set up a false, "strawman" account of the sceptics' position, with respect to the Medieval Warming Period (MWP), which is obviously false. I don't know what sceptical blogs you have and haven't read, but the ones I have read don't try to use the MWP to deny the greenhouse effect**, they point to it to counter claims by climate alarmists that the current temperature level is higher than any time in the past 2,000 years, and to show that the IPCC-sponsored climate scientists fraudulently tried to erase the MWP from history, in order to protect their "hockey stick" graph from easy disproof. So your strawman argument is ludicrous in its biased presentation of the "sceptic" position on the MWP, and I think the moderators of this site should remove your article here, unless and until you remove the travesty of an opening. It may only be that you are yet another sociologist, ignorantly inserting yourself into a debate that properly belongs to physical scientists Whatever the roots of your poor reasoning, I personally think that you have revealed your own bad faith and bias, and I don't think the public should bother itself further with your views on this subject. Your article is a new low here. **P.S. -- I have, on the other hand, actually disproved the greenhouse effect, of increasing temperature with increasing atmospheric carbon dioxide, with a proper comparison of temperatures in the tropospheres of Venus and Earth. Gosh, Mr. Huffman. Chill. Eduardo didn't say anything controversial, and it's not his fault if you prefer different blogs than the ones he has in mind. Both believers and skeptics have plenty of fools. Das Strohmannargument bzgl. des Mittelalterlichen Klimaoptimums als Gegenargument zur AGW-These hat #1 schon ausreichend thematisiert. Sehr geehrter Herr Zorita, ich bin nicht bereit, auf solcher Basis mit Ihnen zu diskutieren. Irgendwann hatte die Klimazwiebel mal den Anspruch des „honest broker“. Sorry, Mr. Zorita, as other commenters above mebtioned you do not understand the sceptics position about former warm periods. 1. We cannot be sure that temperatures will not rise if we cut emissions. 2. We cannot be sure that rising temperatures will cause harm to our society. I do not know any sceptic blogger using the medieval warm period as an example for the non-existence of the greenhouse-effect. Maybe you could provide us with a link. I wrote 'anthropogenic greenhouse effect'. perhaps you got too excited and read the blog too quickly. There are many examples in the blogosphere that defend the following reasoning: past temperatures during certain periods were warmer than today, with lower CO2 concentrations. Thus, the increase of CO2 concentrations over the 20 century is negligible/not important/irrelevant. En exaample is here. Quote:"If it is the case that actually the climate has often been warmer without any significant CO2 emissions having taken place - suggesting that CO2 emissions simply aren't that important - the case for huge efforts to cut those emissions largely disappears". If you read again my blog, you will see that I indicated that the argument based on past temperatures is inadequate 'to prove or to refute' the anthropogenic greenhouse affect. Further, here, the Esper et al paper is presented as global cooling , and is still uncorrected. No 'sceptic' blog that I know has pointed to this clear exaggeration. Nein, das würden die Anhänger der AGW-These nicht tun. Sie sollen etwas tiefer in die AGW-These schauen. Die AGW-These, oder die Zuordnung der rezente Erwärmung zu CO2, bassiert nicht auf Korrelationen zwichen CO2 und Temperatur. Sie basiert auf Modellergebnissen: Simulationen ohne CO2 Anstieg können die Erwärmung nicht reproduzieren. In Ihrem Fall, würden zwei Simulationen mit und ohne Abendgrill die gleiche Temperaturentwicklung ergeben, und ein AGW-Anhänger würde daraus schliessen, dass der Grill keinen Einfluss hat. Vielen Dank für diesen hochinteressanten Beitrag. Ich muss gestehen, dass mir die von Ihnen geschilderte Perspektive beim Lesen des Papers völlig entgangen ist (wie auch die Eisbären ;-). Meine "take home message" war, dass die Frage aufgeworfen ist, ob die MLD-Methode der herkömmlichen Baumringweitenmethode überlegen sein könnte bzw. wie kompatibel diese beiden Methoden zueinander sind. Über ihre Perspektive muss ich erst einmal in Ruhe nachdenken. Schon deshalb hat sich das Lesen für mich gelohnt. "If it is the case that actually the climate has often been warmer without any significant CO2 emissions having taken place - suggesting that CO2 emissions simply aren't that important - the case for huge efforts to cut those emissions largely disappears". Noch einmal: Wenn es in der (historischen) Vergangenheit trotz niedriger CO2-Level wärmer war, kann das in der Zukunft auch passieren. Da die Menschheit darunter in der (historischen) Vergangenheit nicht gelitten hat, wird sie es in der Zukunft erst recht nicht. Es ist also nicht erforderlich, den "anthropogenen Treibhauseffekt" zu bekämpfen. Er ist irrelevant, "the case for huge efforts to cut those emissions largely disappears". "Many bloggers seem to think that if the Medieval Warm Period was warmer than today, it would rule out any effect of anthropogenic CO2." Ich kenne keinen, der das so sieht. Zwischen Existenz und Relevanz ist hier strikt zu unterscheiden. "Many bloggers seem to think that if the Medieval Warm Period was warmer than today, it would rule out any effect of anthropogenic CO2." This is the prototypic skeptic argument: climate changed before, thus we cannot have significant influence. Of course this statement bears logical fallacy. That is why the more educated skeptics don’t use it that way. Most skeptics in the blogosphere therefore use the MWP to argue for a negligible effect of CO2, like in this statement from sks: “It therefore can be safely assumed that there are other factors influencing the climate, by far exceeding CO2 as main driver for climate change.” I agree with Peter Heller that there is a clear difference between a negligible and no effect. However, the conclusion is the same. No action on climate protection is effective. Ich gestehe zu denen zu gehören, die nie verstanden haben, warum der Streit um die Höhe der Temperaturen in der MWP wichtig sei. Ich verfolge ein paar skeptische Blogs regelmäßig, leider habe ich dort auch keine weiteren Erklärungen gefunden. Herr Heller, Sie betonten früher immer, es gäbe nicht DIE skeptische Position, insofern würde ich warnen, Eduardos Beispiel auf alle Skeptiker zu übertragen. Ihren Rettungsversuch von Lewis Page verstehe ich allerdings auch nicht. Macht dessen Argumentation denn nicht nur unter der Annahme, CO2 hätte praktisch keine Wirkung, Sinn? Ansonsten könnte man ja sagen, dass noch energischere CO2-Reduktionsmaßnahmen nötig seien, denn zu der CO2-induzierten Ewärmung können ja noch ca. +1°C Erwärmung durch natürliche Variablität hinzukommen, siehe MWP. Ist es nicht paradox für Skeptiker anzunehmen, dass in der MWP deutlich höhere Temperaturen vorhanden waren? Das hieße doch, dass das Klima viel sensibler auf äußere Veränderungen reagiert als bislang gedacht. Wirbt man damit nicht sogar für höhere Werte der Klimasensitivität? Wenn man sich daraus noch retten wollte, müsste man zeigen, dass sich die Feedbacks einer Erwärung durch solare Aktivität fundamental von Feedbacks einer Erwärmung durch CO2 unterscheiden. Doch dazu ist nichts bekannt. Muss man sich dann nicht in hypothetische Verstärkungsmechanismen der solaren Aktivität flüchten? Ich denke, diese Fragen sind berechtigt, aber auch dazu finde ich in den Skeptikerblogs, die ich aufsuche, nichts. Nein, mein Gefühl war, dass die meisten Skeptiker bei ihrer Argumentation zur MWP nicht wirklich logisch stringent zu Ende denken, sondern eher Argumente gegen Manns "Hockeystick" anbringen wollen, weil man diesen als Symbol bzw. als zentralen Pfeiler der AGW-Theorie interpetiert. Zu Zeiten das TAR mag Manns Hockeystick eine herausgehobene Stellung gehabt haben, aber in heutigen Zeiten mit den unzähligen Temperaturrekonstruktionen kann ich die Debatte um die MWP nur noch als anachronistisch empfinden. Ok, I see, it is not easy. People are not trained in skeptical thinking. Starting point is the alarmistic dogma: “We have to avoid global warming by cutting our emissions.” From a skeptical perspective three questions arise: “Will we, if we do so?”, “Do we really have to?” and “Are we able to?”. The medieval warm period gives answers for the first two. (The third question is not relevant in this discussion here.) First: We probably will not. There is a heater in the room we cannot influence. This heater (natural climate variability) is able to warm or cool the atmosphere independent from our emissions on comparable timescales. Second: We probably do not have to because people in medieval (and ancient) times without modern technology did not only survive, they benefitted from higher temperatures. This is an absolutely sufficient argumentation to reject any measures for emission reduction. We simply cannot be sure, that such measures will show the intended results. Skepticism is not about alternative explanations of the climate system, it’s about describing the logical fallacies of the common viewpoint of climate alarmism. Therefore, Paul, “climate changed before, thus we cannot have significant influence”, is not a prototypic skeptic argument. “Climate changed before, thus our influence might be irrelevant” is one. Gerne noch einmal auf Deutsch: Jedwede politische Maßnahme hat sich an ihrer Sinnhaftigkeit zu messen. Ist es also sicher, daß man eine globale Erwärmung durch Emissionsreduktion vermeiden kann? Ist es sicher, daß man eine globale Erwärmung vermeiden muß, um nicht katastrophale Folgen zu sehen? Die Antwort der MWP auf beide Fragen: Nein. Aus diesem Grund wurde ja der Hockeystick präsentiert. Man wollte zeigen, daß es keine relevante natürliche Klimavariabilität auf historischen Zeiträumen von Jahrhunderten gibt. Und die Sorge verstärken, die Menschheit könne unzureichend ausgestattet sein, mit wärmeren Temperaturen zu leben. Die Arbeit von Esper zeigt vor allem eines: Man kann CO2 vermeiden, wie man will. Wärmer könnte es trotzdem werden. Oder kälter. Oder es bleibt wie es ist. Also, und das ist Skeptizismus, wie er nach meiner Auffassung in "meinem Lager" breit geteilt wird, das "Klimaproblem" ist gar kein Problem. Es ist irrelevant. "Do I want to test it? No"
But you have to. There is no way to escape from the future and its uncertainty. @Peter Heller: "Jedwede politische Maßnahme hat sich an ihrer Sinnhaftigkeit zu messen. Ist es also sicher, daß man eine globale Erwärmung durch Emissionsreduktion vermeiden kann? Ist es sicher, daß man eine globale Erwärmung vermeiden muß, um nicht katastrophale Folgen zu sehen?" Sie werfen hier ein Attribut wie "sicher" in die Runde, ohne vorher mal anzudeuten, was Sie eigentlich mit "sicher" bzgl. wissenschaftlichen Vorhersagen überhaupt meinen. Wollen Sie Unsicherheit als Ausschlusskritium von Entscheidungsprozessen postulieren? I really cannot understand your distinction between between 'irrelevance' and 'non-existence'. There is no essential difference in this context. You argue that the reasoning of the sceptics is that the anthropogenic greenhouse effect exists but due to the that warmer temperatures in the past this is effect is unimportant or no to worry about.. This argument is also wrong and contradictory in itself. The fact that other natural factors have controlled temperatures in the past does not say anything about their relative importance in the future or in the present. CO2 concentrations - and I assume you would agree here - will grow unabated in the next decades to levels above those seen in the Holocene. Actually, not seen in the last million years. We do not know yet how large this effect will be. Climate models are imperfect , have flaws and provide different answers. But you cannot claim that past behaviour is a guide to the future in this case. Furthermore, the discussions about temperatures in the MWP hover over values of a half a degree above present temperatures. Maybe in the Midholocene, temperatures could have been 1 degree ( I am speculating here). The model based predictions for 2100 are in the range of 1.5-4 degrees. I could understand the argument that climate models are unreliable, but I cannot understand the argument that the MWP delivers us from any worry. . I do not share your interpretation of the apparently 'real' sceptics argument. If this is the argument, it is very weak indeed. We can never be sure of anything. Science theories doe not provide assurance. They explain facts and they are eventually replaced by better theories. AGW theory states that if CO2 concentrations grow temperatures will rise, all other factors remaining unchanged. To argue that maybe other natural factors will eventually counteract the greenhouse affect is not science. They could counteract it or they could reinforce it. I could argue that if I jump through the window perhaps I will survive because since planes can fly, I cannot be sure I am going to fall down. This artificial reasoning is a logical replica of point 1. Ganz im Gegenteil, Herr Hader, ich möchte Unsicherheiten in politischen Entscheidungsprozessen wieder berücksichtigt sehen. 1. Natürliche Faktoren sind gegenüber anthropogenen vernachlässigbar oder nicht. 2. Der Klimawandel ist eine (nennenswerte) Gefahr oder nicht. Daraus kann man vier potentielle Zukunftsszenarien konstruieren. In drei davon ist "Klimaschutz" keine besonders gute Idee. Das ist völlig ausreichend, um ihn abzulehnen. Gesucht werden Maßnahmen, die nicht nur in 25%, sondern in 100% der denkbaren Zukünfte funktionieren. Die MWP zeigt auf, daß dieser Ansatz begründet ist. Dem IPCC war das schon immer völlig klar und deswegen hat man versucht, die MWP auszuradieren. (ich kann das jetzt nicht so gut auf Englisch) Sie haben die Debatte mit der Interpretation ausgelöst, für die Skeptiker (oder zumindest eine nennenswerte Zahl dieser) sei die MWP ein Beleg dafür, daß die anthropogenen Emissionen keinen Effekt hätten. Dies ist nicht korrekt. In der Debatte über die Klimaforschung wird die MWP (s. Kommentar #1) respektive ihre Marginalisierung durch den Hockeystick allgemein als Beleg für die politische Instrumentalisierung der Forschung (durch die Forscher selbst) angesehen. Zusätzlich wird seitens der Skeptiker die MWP angeführt, um den Unsinn einer politischen Fixierung auf Zwangsmaßnahmen zur Emissionsreduzierung herauszuarbeiten. "We can never be sure of anything. Science theories do not provide assurance." Das ist genau das, was die Skeptiker seit Jahren behaupten. In immer wieder anderen Formulierungen, weil (wie hier ja auch) diese simple Tatsache in der Klimapolitik nicht berücksichtigt wird. Es sind die Alarmisten, die die absolute Sicherheit verbreiten, eine Klimakatastrophe wäre ohne rigideste Emissionsreduzierungen nicht zu vermeiden und würde zwangsläufig in den Weltuntergang führen. Der WBGU (Schellnhuber, Rahmstorf et al.) bspw. nennt die Vermeidung des Klimawandels eine "conditio sine qua non" für das Überleben unserer Zivilisation. Alle klimapolitischen Maßnahmen beruhen auf dieser absoluten Sicherheit, beruhen auf der Aussage, es gäbe hier keine Unsicherheiten mehr und die Klimaforschung hätte dies gezeigt. Anders wären so seltsame Ideen wie ein Emissionshandel oder das Glühbirnenverbot auch nicht möglich gewesen. Die MWP zeigt, daß diese Sicherheit nicht gerechtfertigt war und ist. Und exakt so wird sie von den Skeptikern, die ich dazu gelesen habe, auch argumentativ eingesetzt. Daraus kann man vier potentielle Zukunftsszenarien konstruieren. In drei davon ist "Klimaschutz" keine besonders gute Idee. Das ist völlig ausreichend, um ihn abzulehnen. Wie kommen Sie darauf, dass alle Ausgänge gleich wahrscheinlich sind? Ich vermute, Sie haben bei 1 und 2 die Wahrscheinlichkeiten für Ereignis und Gegenereignis mit jeweils 50% abgeschätzt. Kühne Annahme, kühnes Ergebnis. "Ich vermute, Sie haben bei 1 und 2 die Wahrscheinlichkeiten für Ereignis und Gegenereignis mit jeweils 50% abgeschätzt." Nein. Szenarien (und Projektionen als verkettete Szenarien) weisen qua Definition keine "Eintrittswahrscheinlichkeit" auf. Der Begriff ist in diesem Zusammenhang schlicht sinnlos, weil Szenarien als denkbare Entwicklungen konstruiert werden und nicht als gewünschte oder zu erreichende. Der tiefere Sinn hinter diesem Ansatz besteht darin, sich (bspw. Unternehmen, Politik) auf möglichst viele Zukünfte vorbereiten zu können und möglichst "nichts zu übersehen" vor allem nicht Rahmenbedingungen, die man nicht beeinflussen kann. Das Beispiel ist natürlich extrem simplifiziert und soll nur das Prinzip verdeutlichen. Gemeinhin sind hunderte Faktoren mit entsprechend vielen Ausprägungen zu berücksichtigen, von denen einige Dutzend sogenannte Hebelkräfte sind, die wiederum andere Faktoren beeinflussen. Es entstehen dann zwangsläufig einige Millionen denkbare Zukünfte. Die eigentliche Kunst ist, diese klug zu clustern und nutzbar (für den Kunden) zu beschreiben. Hieran kann man die Differenz zwischen Skeptiker und Alarmist in der Klimadebatte besonders deutlich machen. Der Alarmist bewertet diese Zukünfte und sucht sich genau eine heraus, die er als "wahrscheinlichste" empfindet (ohne das rational begründen zu können). Der Skeptiker sagt, alles, was denkbar ist, könnte auch eintreten, also ist es zu beachten. Die Annahme vieler hier ist aber leider immer noch, Skeptiker würden zur "Alarmistenzukunft" eine konkrete "Gegenzukunft" als Alternative anbieten. Das ist auch der Irrtum, dem Herr Zorita hier unterliegt. Ich fürchte, das ist einfach zu abstrakt für viele Teilnehmer der Debatte, die in dieser Art zu denken einfach nicht geübt sind. Man versteht es wahrscheinlich erst dann wirklich, wenn man selbst schon einmal Szenarien entwickelt hat (die niemals, niemals mit Prognosen verwechselt werden sollten). "Daraus kann man vier potentielle Zukunftsszenarien konstruieren. In drei davon ist "Klimaschutz" keine besonders gute Idee. Das ist völlig ausreichend, um ihn abzulehnen." "Es sind die Alarmisten, die die absolute Sicherheit verbreiten, eine Klimakatastrophe wäre ohne rigideste Emissionsreduzierungen nicht zu vermeiden und würde zwangsläufig in den Weltuntergang führen." So setzt man halt Gerüchte in die Welt. Ich bin ja in den Augen der Skeptiker auch ein Alarmist. Ich gehe nicht von der absoluten Sicherheit der Ergebnisse aus, sondern halte die Unsicherheiten bzgl. der Folgen für normal. Bei mir werden Sie auch nicht das Wort Weltuntergang finden. Warum auch? Eine 5°C wärmere Erde würde nicht untergehen. Wohin auch? Trotzdem ist es keine schöne Situation, wenn dieses in innerhalb einer handvoll Jahrzehnte eintreffen würde. Es wäre auch ein ziemlich merkwürdiges Verständnis von Entscheidungsfindung, wenn man suggerieren würde, dass man bei allem, was weniger als "Weltuntergang" ist, schon gar nicht mehr die Finger rührt. Die Notwendigkeit zu Handeln ist doch schon bei viel geringeren Anläßen gegeben. Soso, Herr Hader, wollen Sie "Klimaschutz" jetzt neu definieren? Ich war am 4.11.2010 in Hannover und habe mir den Vortrag von Otmar Edenhofer, seines Zeichens Vize-Chair der IPCC WG3, angehört. Seine Aussage war an Klarheit nicht zu überbieten: Maximal 400 Gt Kohlenstoff dürfen wir noch emittieren, sonst ist Ende. Aus und vorbei. Abermilliarden Tote und Ende der Zivilisation. Vom Rest der Biosphäre ganz zu schweigen. Herr Edenhofer, Herr Schellnhuber und Herr Rahmstorf waren da überaus deutlich (die waren gleich alle drei aufgefahren). So steht es auch im WBGU-Bericht "Große Transformation", können Sie nachlesen. Die 2-Grad-Grenze wird von diesen Herren absolut gesetzt, ohne jeden Zweifel. Nach gegenwärtigem Stand aber werden wir die 400 Gt noch vor 2050 erreichen. Zweitens hat auch Edenhofer deutlich darauf hingewiesen, daß noch mindestens 11.000 Gt im Boden liegen (die PIK-Leute haben nie an Peak Oil geglaubt, zu Recht). Man müsse also erzwingen, daß diese 11.000 Gt niemals gefördert werden. Kohle-, Öl- und Gaskonzerne seien zu enteignen. Das ist die klare und eindeutige Forderung der alarmistischen Klimaschützer. Darüber diskutiere ich hier, nicht über weichgespülten Wischi-Waschi-Kram. Diese Institutionen sollen enteignen, verbieten, regulieren, erzwingen - und zwar die gesamte Palette der Maßnahmen, die auch im WBGU-Bericht gefordert werden. Das ist Klimaschutz. Genau so ist er gemeint. Manchmal habe ich schon den Eindruck, viele Leser hier haben eine etwas naive Sicht auf das Thema. Klimaschutz ist keine Wohlfühl-Umweltpolitik für das grüne Gewissen neureicher Vorstädter. Klimaschutz ist knallharte Planwirtschaft und ein direkter Angriff auf individuelle Freiheitsrechte und demokratische Teilhabe. Da gibt es keine Ausgewogenheit, kein "sowohl/als auch" und keine Grauzone. "Soso, Herr Hader, wollen Sie "Klimaschutz" jetzt neu definieren?" Nein, ich möchte nur nicht die Definition einzelnen Personen überlassen. Wenn jemand Klimaschutz durch Aushebelung der Demokratie umsetzen will, dann gehört das genauso unter Kritik gestellt, wie gedankenlose Umweltzerstörung und sinnlose Ressourcenverschwendung. "Klimaschutz ist knallharte Planwirtschaft und ein direkter Angriff auf individuelle Freiheitsrechte und demokratische Teilhabe. Da gibt es keine Ausgewogenheit, kein "sowohl/als auch" und keine Grauzone." Sachte, sachte Herr Heller. Wie waere es, sie setzten sich mit differenzierten Argumenten auseiander, wie z.B. dem von Felx Mormann ("Requirements for a Renewables Revolution")? Das haette zudem den Vorteil, dass der thread nicht allzusehr OT geraet. Wir diskutieren darüber, ob die Arbeit von Jesper et al. für die Bewertung des politischen Zieles "Klimaschutz" relevant ist, oder nicht. Und da müssen wir schon alle unter "Klimaschutz" dasselbe verstehen. Jeder mag sein eigenes individuelles Konzept haben. Aber dann reden wir eben aneinander vorbei. "Klimaschutz" bedeutet "2-Grad-Ziel" und die absolute, nicht verhandelbare Notwendigkeit, dieses einzuhalten. Das ist politisch so entschieden und verankert. Das ist, wovon ich spreche. Bspw. im WBGU-Bericht "Große Transformation" sind die dazu erforderlichen Maßnahmen klar definiert. Zusammen mit der Überzeugung, diese Maßnahmen wären nicht nur notwendig, sondern auch hinreichend. Dies ist letztendlich die Begründung für diese Empfehlungen: Sie werden mit einer andernfalls eintretenden Katastrophe begründet. So ist die Realität der politischen Debatte in Deutschland. Und hier zeigen Jesper et al. eben zwei Dinge auf: Das Ziel ist erstens nicht gerechtfertigt. Und zweitens sind die definierten Maßnahmen eben nicht hinreichend. Es ist vielmehr unmöglich, hinreichende Maßnahmen zu definieren. Das politisch etablierte "Klimaschutz"-Konzept wäre damit hinfällig. Exakt so wird das Paper von den (meisten, ich kenne jedenfalls keine Ausnahme) Skeptikern aufgefasst und verargumentiert. Das hat absolut nichts mit Treibhauseffekt oder Klimasensitivität auf der einen bzw. ein paar subventionierten Windrädern auf der anderen Seite zu tun. Wo zeigt Esper et al., dass 2Grad nicht gerechtfertigt ist? Ich sag nicht, dass 2Grad gerechtfertigt ist, aber ich sehe auch nicht wie Esper2012 da etwas dagegen sagt. Noch viel weniger sehe ich aber, wie es sagt, dass die Massnahmen nicht hinreichen? Genauer lesen, bitte! Das steht in Esper et al. direkt nach dem Abschnitt, der zeigt, dass "man CO2 vermeiden kann, wie man will. Wärmer könnte es trotzdem werden. Oder kälter. Oder es bleibt wie es ist." Und vor dem Abschnitt, der die Notwendigkeit eines Iranischen Atomenergieprogrammes aufzeigt (das ist auf der gleichen Seite, auf der auch die Schönheit der finnischen Wälder besungen wird). Man muss eben richtig interpretieren! Und jetzt kommen Sie mir bitte nicht mit irgendwelche Ko-Autoren, die behaupten sie hätten etwas anderes geschrieben. Denn auch für die gilt, daß "das einfach zu abstrakt ist für viele Teilnehmer der Debatte, die in dieser Art zu denken einfach nicht geübt sind." Es stehen doch nur 25 Kommentare über Ihnen. Ist es denn wirklich so schwierig, da den roten Faden zu behalten? Ausgangspunkt der Debatte war die Auffassung von Herrn Zorita, die Arbeit von Jesper et al. würde seitens der Skeptiker angesehen als Möglichkeit "to demonstrate or refute the possible effect of CO2 on the temperatures today." Ich kenne aber keinen, der das so sieht. Die Skeptiker, die ich kenne (mich eingeschlossen) argumentieren völlig anders. Das "2-Grad-Ziel" beruht auf der Annahme, die Menschheit hätte sich in den vergangenen x-tausend Jahren bei weitgehend konstanten Temperaturen entwickelt und könne daher mit vergleichsweise kurzfristigen Änderungen nicht umgehen. Um dies zu belegen, konstruierte man den Hockey-Stick. Mittlerweile ist aber klar - eben beispielsweise durch Jesper et al. - daß es diese Konstanz in den Temperaturen wohl doch nicht gegeben hat. Die zu ergreifenden Maßnahmen, um das 2-Grad-Ziel einzuhalten, sind fundamentaler Natur. Sie erfordern (Zitat WBGU) "tiefgreifende Änderungen Änderungen von Lebensstilen, Infrastrukturen, Produktionsprozessen und Regulierungssystemen". Man rechtfertigt diese Maßnahmen daher nicht nur mit ihrer Notwendigkeit angesichts einer Klimakatastrophe, sondern verspricht auch ihren sicheren Erfolg (denn sonst wäre wohl nichts davon auch nur im Ansatz durchsetzbar). Diesen sicheren Erfolg wiederum leitet man daraus ab, auf den entsprechenden Zeitskalen in den entsprechenden Größenordnungen könne eben nur der Mensch das Klimasystem so beeinflussen. Jesper et al. zeigen bspw., daß natürliche Faktoren da durchaus mithalten können. Damit wären die Maßnahmen nicht mehr hinreichend. Und eine wesentliche argumentative Grundlage für ihre Etablierung entfällt. Das ist den IPCC-Oberen völlig klar. Deswegen wurden über die Jahre nicht nur der Hockey-Stick mit Zähnen und Klauen verteidigt, sondern auch neue Ideen (bspw. Svensmark-Effekt) ignoriert bzw. heftig bekämpft. Ob Sie mir das jetzt glauben oder nicht, ist mir echt egal. Sie können das alles nachlesen, in vielen IPCC-Dokumenten, in den politischen Papieren (bspw. der Bundesregierung), im WBGU-Bericht usw.. Ich habe in den letzten zwei Jahren eine Reihe Vorträge von Schellnhuber, Edenhofer, Latif, Meadows, Töpfer et al. besucht, in denen exakt diese Linie vertreten wurde. Und ich habe zahlreichen Funktionären diverser Umweltverbände gegenübergesessen, die exakt dies unter Klimaschutz verstanden haben. Mir ging es nur darum, Herrn Zorita zu erklären, daß die meisten Skeptiker (ich wie gesagt kenne keine Ausnahme) Arbeiten wie die von Jesper et al. bzw. die MWP an sich als Argumentation gegen exakt dieses etablierte Klimaschutz-Konzept verwenden. Und eben genau nicht als Gegenbeweis zum Treibhaus-Effekt bzw. zur Klimawirksamkeit anthropogener Emissionen. Was, himmelherrgottsakra, ist daran nicht zu verstehen? Sie können ja sagen (wie Herr Zorita), das wären schwache Argumente (ich finde die Argumentation im Gegenteil ziemlich stark), Sie können gerne auch anderer Auffassung sein, aber was hindert eigentlich Sie (und alle anderen hier), nachdem ich es nun x-mal mit immer wieder anderen Worten erklärt habe, das Argument und meinen Einspruch gegen Herrn Zoritas Darstellung zu begreifen? Genau das ist meine Interpretation der Argumente der sogenannten Skeptiker bezüglich des MWP. Es handelt sich dabei nur um politische Argumente: da Der IPCC hier geirrt hat, kann man daraus Kapital schlagen. Das hat Beitrag nummre 1 klar gezeigt. Mir ging es aber um die wissenschaftliche Argumentation, und die ist für mich immer noch nicht korrekt. Warum das Mittelalterliche Optimum ? ich könnte genauso mir die Temperaturen vor 100 Millionen Jahren. damals waren die arktischen Temperaturen ca. 15 Celsius. Kann ich dann daraus schließen, dass CO2 keinen Effekt hat so lange die arktischen Temperaturen unter 15 Celsius bleiben ? oder genauso gut könnte man 5 Milliarden Jahre zurückschauen. Damals waren die Temperaturen an der Oberfläche vielleicht mehrere Hundert Grad Celsius. Diese Argumentation führt zum logischen Absurdum. Nehmen wir an, CO2 hat im 20. Jahrhundert einen Temperaturanstieg vom .5 C doch verursacht hat, und dass die Temperaturen im MWP ca 0.5 K höher als heute waren. Dann ist der Treibhauseffekt diesem Argument nach nicht wichtig. Nehmen wir auch an, der aktuellem Temperaturtrend (0.12 C pro Dekade) setzt sich unverändert vor. Das heisst in ca 40 Jahren erreicht die Erde nochmals die Temperaturen des MWPs. Soll ich dann daraus schließen, dass der CO2 bis 2050 keinen Effekt haben wird, aber ab 2051 schlagartig doch seine Wirkung zeigt ? Als ich schon schrieb, man kann für oder gegen die Wirkung der aktuellen von CO2-Konzentration argumentieren, nicht aber auf der Basis von Temperaturen der Vergangenheit, wenn diese Temperaturen durch völlig andere, noch nicht quantifizierbaren, Faktoren gesteuert werden können . Weil in dieser Zeit Menschen auf der Erde gelebt haben und ihr zeitlicher Abstand (einige Jahrhunderte) vergleichbar ist zu der Reichweite von Klimamodellen (100+ Jahre). "Als ich schon schrieb, man kann für oder gegen die Wirkung der aktuellen von CO2-Konzentration argumentieren, nicht aber auf der Basis von Temperaturen der Vergangenheit, wenn diese Temperaturen durch völlig andere, noch nicht quantifizierbaren, Faktoren gesteuert werden können." Die MWP zeigt offensichtlich, daß "diese Temperaturen durch völlig andere, noch nicht quantifizierbaren, Faktoren gesteuert werden können". Ergo können wir nicht sicher sein, ein Klimaziel "2 Grad" durch Emissionsminderungen zu erreichen. Man sollte eben nicht "trotzdem" versuchen, das Ziel zu erreichen. Denn dieser Versuch ist mit einem derart enormen Aufwand (sprich. Wertevernichtung und Wohlstandsverlust) verbunden, daß er sich bei nicht sicherem Erfolg von selbst verbietet. Das ist das Skeptiker-Argument. "Es sind einfach völlig unterschiedliche Zeitskalen und völlig unterschiedliche Antriebe"
Daß es "völlig unterschiedliche Antriebe" sind, ist ja gerade das Argument. Der von Jesper et al. beschriebene ist eben nicht durch den Menschen beeinflussbar. Ich finde die Skalen (Jahrhunderte und Zehntelgrade) ähnlich genug. Aber ich lasse mich gerne auf einen Kompromiss dahingehend ein, Jesper et al. als Indiz zu werten und nicht als Beweis. Es ist ja auch nur ein Beispiel von vielen für die Existenz einer MWP. Und man sollte auch abwarten, inwieweit diese Untersuchung wissenschaftlich Bestand hat. Wenn das 2°-Ziel auch durch natürliche Variabilität überschritten werden kann (wofür ich in Espers Arbeit überhaupt keinen Anhaltspunkt finde, die dargestellte Variabilität halte ich für eine regionale Rekonstruktion für normal),dann ist das Ziel eben verpasst und dann ist es auch egal, ob noch 3-6°C vom CO2 dazukommen. Ganz so, als wären die Klimafolgen für Temperaturen jenseits der +2°C konstant. Das Gegenteil ist doch richtig, die Schäden steigen mit jedem Zehntelgrad mehr, und zwar nichtlinear. "Und hier zeigen Jesper et al. eben zwei Dinge auf: Das Ziel ist erstens nicht gerechtfertigt." Herr Heller: Herrgottsakkra (oder so). Ja, ich habe verstanden woher dieser Thread kommt. Ich verstehe auch, was sie behaupten was das Skeptikerargument ist. Ich bin nicht ueberzeugt, dass dies das Argument ist, aber das ist ja egal. Aber, wie Eduardo und Andreas Ihnen schon mitteilten, ist Ihre Verbindung von Jan Esper et al und 2Grad-Ziel unlogisch und unzulaessig. Sie instrumentalisieren eine Studie, die fuer den Sommer und eine Region einen natuerlichen (orbitalen) Abkuehlungstrend zeigt, um Schlussfolgerungen ueber ein global gerechnetes Ziel zu ziehen. Ein globales Ziel dass fuer Ihren Wohnort ebensogut einen Null-Trend wie einen 4Grad-Anstieg bedeuten kann (um dies hier zu ueberspitzen). Vor allem aber, koennen Sie aus diesem regionalen Sommer-Trend ueberhaupt keine Schlussfolgerungen ziehen, dass die Massnahmen eh nichts nuetzen. Dazu koennen Sie in ihrer Argumentation von mir aus gern (wie ein paar Ihrer Skeptikerkollegen) den von mir gerade gegebenen Link nutzen, aber sicher nicht Esper2012. Puh. So langsam also glaube ich wieder an die Vernunft. Es ist also doch deutlich geworden, daß ich (und andere Skeptiker, die ich kenne) nicht behaupte, die MWP wäre einen Beleg für die nichtvorhandene Klimawirkung von CO2. Das war mir einfach wichtig. Der Rest ist dann wirklich OT. Wenn das 2°-Ziel auch durch natürliche Variabilität überschritten werden kann (wofür ich in Espers Arbeit überhaupt keinen Anhaltspunkt finde, die dargestellte Variabilität halte ich für eine regionale Rekonstruktion für normal),dann ist das Ziel eben verpasst und dann ist es auch egal, ob noch 3-6°C vom CO2 dazukommen. Ganz so, als wären die Klimafolgen für Temperaturen jenseits der +2°C konstant. Das Gegenteil ist doch richtig, die Schäden steigen mit jedem Zehntelgrad mehr, und zwar nichtlinear." Das haben Sie ganz richtig verstanden. Nur stammt das nicht von mir. Das sind die Kipp-Punkte von Herrn Schellnhuber. Jenseits von 2 Grad ist es in der Tat egal, dann ist nix mehr zu retten (bspw. Eisschmelze und Meeresspiegelanstieg). Vielleicht noch einmal zur Verdeutlichung. Esper et al. ist kein Beweis dafür, daß 2-Grad in der Zukunft auch ohne menschliches Zutun sicher überschritten werden. Esper et al. ist ein Indiz dafür, daß auf allen Ebenen (regional wie global) die Zukunft des Klimas unvorhersehbar und vor allem unsteuerbar ist. @Peter Heller: "Esper et al. ist ein Indiz dafür, daß auf allen Ebenen (regional wie global) die Zukunft des Klimas unvorhersehbar und vor allem unsteuerbar ist." Das mit der Unvorhersehbarkeit will ich mal hinten anstellen, dass ist sowieso der Gesprächsstoff von bisher tausenden Forumsdiskussionen. Aber wo ergibt sich aus der Studie, dass das Klima unsteuerbar ist? "Die Politiker denken aber, beeinflusst durch das IPCC auf globaler und durch das PIK auf bundesdeutscher Ebene, sie könnten dem Klima sagen, was zu tun ist..."
Es würde ja schon mal helfen, wenn wir in das Klima nicht weiterhin mit dem massenhaften Ausstoß von CO2 wie in den vergangenen Jahrzehnten eingreifen würden. Ein zugegebenermassen großes und ambitioniertes Ziel, welches sich aber anzustreben lohnt, selbst wenn bei Erfolgslosigkeit kein Weltuntergang droht. P.S. : Haben Sie den Artikel von Prof.Hillerbrand gelesen? Mir zeigt die Arbeit von Esper et al. eher, wie berechenbar und vorhersehbar Klima ist. Über 2000 Jahre hinweg folgte das Klima gehorsam dem von Milankovic-Zyklen verursachten Trend, langfristig unbeeinflusst von natürlicher Variabilität. "Puh. So langsam also glaube ich wieder an die Vernunft. Es ist also doch deutlich geworden, daß ich (und andere Skeptiker, die ich kenne) nicht behaupte, die MWP wäre einen Beleg für die nichtvorhandene Klimawirkung von CO2." Nun Herr Heller, wenn ich Sie richtig verstanden habe - und das ist bei der kakophonischen Natur des Skeptikerzirkels manchmal schwer -, behaupten Sie die MWP wäre ein Beleg, für eine gering vorhandene Klimawirkung von CO2. So richtig (puh) erlichtert und vernunftglöäubig können wir also doch nicht sein. "Nun Herr Heller, wenn ich Sie richtig verstanden habe..."
Ich halte die MWP für ein Indiz, daß Emissionsreduzierungen völlig sinnlos sein könnten, unabhängig davon, wie hoch man nun die Klimawirkung von CO2 einschätzt. Man wird nicht Skeptiker, weil man etwas besser weiß. Man wird Skeptiker, weil man verstanden hat, daß andere die Dinge niemals so genau wissen können, wie sie behaupten. Danke für die reference zu Prof. Hillerbrand. "There is nothing wrong with the precautionary principle—as long as it is not used for decision-making"
Habe ich auch schon mal von Herrn Heller gelesen. Mal eine Frage an die Fachleute. noch in der natürlichen Variabilität liegt und was bedeutet das für das Detection und Attribution Argument von Hegerl et al. ? I would say the implicit argument goes like this. What reason do we have to think there is a problem with CO2 emissions? Because we can't explain modern warming without CO2, so it's CO2 fault, and it will get warmer. We assume we know the acting forcings, and roughly the system dynamics. But then, what caused the MWP? You tell us we don't know the forcings then, but you mention volcanoes (cooling forcing, and not for too long), and solar irradiance, which is too small a forcing (according to IPCC). So, we still don't know what possible forcings were acting then. A good guess is we don't know enough about the system to trust an attribution. Other way of saying it: that past behaviour is not a guide to the future, but is a guide to know our ignorance. Unless we have a good list of possible and plausible forcings for the MWP. Do we have them? CO2 --> unprecedented => warming --> unprecedented. But it doesn't work (because of the MWP) and we need to be more serious. In the public discussion it is very relevant. And it is alarmist's fault. You can't blame the sceptics. I guess I should have asked in english. Doesn't the Esper et al. paper show that the 20th century temperahture is within natural variability? In turn what does this mean for the detection änder attribution Argument of Hegerl et al. ? Sorry for the typo, my autocorrectiion Play with me. In turn what does this mean for the detection and attribution Argument of Hegerl et al. ? Das paper vergleicht nicht exolizit die Temperaturen heute und vor zwei Tausand Jahren. Das Paper lediglich errechnet den Langfristigeb Temperaturtrend . Auf dem Trend ueberlagert sind viele andere kurfristigere Schwankung, z.B. Das MWP oder die Kleine Eiszeit und andere. Dass die heutigen Temperaturen innerhalb der natuerlichen Variabilitaet liegen ist nicht umstritten. Wie ich schon schrieb, waren die Temperaturen vor 100 millionen Jahren viel waermer als heute. Das war auch natuerlich verursacht. Attribution ist im Wesentlichen die (kleine) Wahrscheinlichkeit,, dass die rezente Erwaermung ohne CO2 erklaert werden kann. Vielleicht sollten wir in einem getrennten Eintrag erklaeren und diskutieren, was Attribution wirklich bedeutet. But we know the forcings now. Again, for attribution, past behaviour is not directly relevant. Let me illustrate this by another example. In the 80s, some people got sick and died because of aids. One way of reasoning is: we cannot explain these deaths, so we have to find out what is happenning. We have several hypothesis, but in the end, we zero in one virus. People that are not infected still die , for instance from car accidents, but we can explain those other deaths. Now we make some animals with animals infected and not infected by that virus. The other way of reasoning , the one that I do not understand, would go like this: well, many people die, so the cause can be whatever natural cause. No need to worry about it. Of course, in other cases as in the cucumber crisis last year, the first suspected cause was not correct, and this risk is always present. In the end it is a political decission to act or not to act, assessing the risks and the costs. Science can only inform to evaluate those. Although you may be right, and you are the expert, I don't find the argument particularly convincing. You think we know the forcings now. Also the system's working - say unforced variability. You need this to be sure we know the forcings. But if we knew all this, we would have pretty decent predictions. OK, there is some heavy discussion about the quality of the predictions. You may be along those who still think model's predictions are good enough. But if temperatures keep going as they are, say ten more years, nobody will be able to defend models have enough knowledge of the system. - Ask the experts the conditions of falsification, and wait the time needed to check. Sorry, but methinks believing experts blindly (without falsification, checking, and so on), is not a sensible way. Call it scepticism if you like. MWP has a lot to do with this. The temperature record is to short, and showing some (just some) ability to explain the temperature during this very short period is nothing to be very comfortable about. So, first thing is to look at the closest warm period we know. And then, surprise! We can't explain it. Hmmm ... as I said, this doesn't look convincing at all. "Dass die heutigen Temperaturen innerhalb der natuerlichen Variabilitaet liegen ist nicht umstritten"
In Mojib Latifs Buch "Klimawandel und Klimadynamik" habe ich über die "optimal Fingerprint Methode" von Hegel er al. gelesen die auch in den AR4 massgeblich mit eingegangen ist. Eine Vorrausetzung für diese Methode ist, dass man die natürliche Variabilität kennt. Laut Latifs setzen Hegerl et al. eine natürliche Variabilität gemäß +|- 2 Sigma vorraus und schließen, dass Mitte der 90iger das Signal aus der natürlichen Variabilität rausläuft. Ihre Argumentation und das Paper sprechen also gegen das "Detection and Attribution"
Argument von Hegerl er al. Das finde ich jetzt spannend und naturwissenschaftlich interessant nach all dem Politiktalk. Vielleicht habe ich aber auch nur Latifs Buch dazu nicht richtig verstanden. Wenn ja wäre ich dankbar für eine Erklärung von Ihnen oder einem anderen kompetenten Klimaforscher. ich denke, man sollte die Attributionsfrage nicht auf die Methode von Hegerl et al. verkürzen. "Can the Warming of the 20th Century be Explained by Natural Variability? It is very unlikely that the 20th-century warming can be explained by natural causes. The late 20th century has been unusually warm. Palaeoclimatic reconstructions show that the second half of the 20th century was likely the warmest 50-year period in the Northern Hemisphere in the last 1300 years. This rapid warming is consistent with the scientific understanding of how the climate should respond to a rapid increase in greenhouse gases like that which has occurred over the past century, and the warming is inconsistent with the scientific understanding of how the climate should respond to natural external factors such as variability in solar output and volcanic activity. Climate models provide a suitable tool to study the various influences on the Earth’s climate. When the effects of increasing levels of greenhouse gases are included in the models, as well as natural external factors, the models produce good simulations of the warming that has occurred over the past century. The models fail to reproduce the observed warming when run using only natural factors. 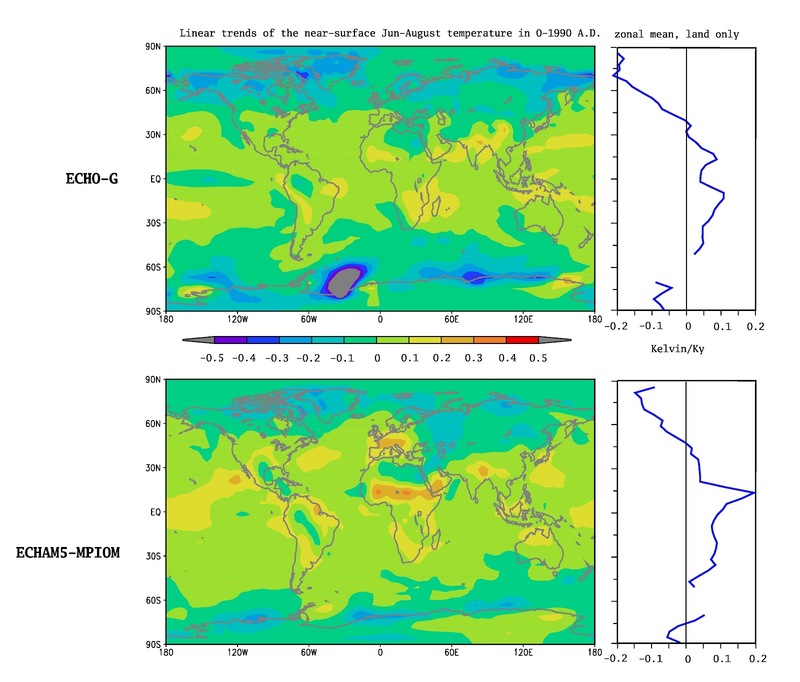 When human factors are included, the models also simulate a geographic pattern of temperature change around the globe similar to that which has occurred in recent decades. This spatial pattern, which has features such as a greater warming at high northern latitudes, differs from the most important patterns of natural climate variability that are associated with internal climate processes, such as El Niño." eine Frage hätte ich noch: Um welches Paper von Hegerl handelt es sich genau? Ich habe gerade im AR4 im Kapitel 9 zu attribution nachgeschaut und zu meiner Überraschung festgestellt, dass es da vor Hegerls geradezu wimmelt. Das geht jetzt leider nur auf Deutsch und Von Storch und Zorita werden mich jederzeit korrigieren. Hegerls (oder auch Hasselmanns oder auch Allen and Stotts) fingerprinting braucht eine Annahme über das Forcing und eine Annahme über die natürliche 'ungestörte' Variabilität. Die natürlich 'gestörte' (Sonne, Vulkane, Orbital, Land-Nutzungs-Änderungen, natürliche Änderungen von Treibhausgasen) und die natürliche 'ungestörte' Variabilität werden beide (einzeln oder zusammen) gelegentlich als natürliche Varibilität bezeichnet. Für die natürliche ungestörte Variabilität werden in der Regel Annahmen aus den Modellen gewählt (richtig?). Aus diesen Kenntnissen lassen sich dann die 'optimalen Fingerabdrücke' der einzelnen Antriebskomponenten bestimmen. So ist es dann auch möglich ein Kriterium zu entwickeln um festzustellen wann das anthropogene Signal aus den anderen Antrieben heraus'sticht'. Dies lässt sich global machen oder auch regional (Hegerl 1996, 1997, 2000, 2001, 2002, 2003, 2006a,b, 2007, 2011a-c). Ich habe mir das Buch von Prof. Latif gekauft und es durchgearbeitet, um mich auf den Stand des Fundaments zu bringen den laut Klappentext von Latif der Student der Klimatologie so braucht. Erschreckend niedriges Niveau, so als Randbemerkung, so dass ich hoffe der Klappentext wurde nicht von Latif verfasst. So dass ich es auch weiterempfehle. Man kann es locker in einem Monat durcharbeiten. Wie auch immer Latif führt drei Argumente fürs CO2 an. 1. Ohne CO2 Forcing schaffen die Computer es nicht den Temperaturverlauf des 20. Jahrhunderts zu simulieren, für mich wie Du weißt ein dünnes Argument. Nun die transformieren glaube ich das Signal in irgendeinem sinnvollem Vektorraum, gefolgt von einer Projektion oder so und kriegen dadurch ein besseres Signal zu Rausch Verhältnis. Finde ich jetzt trickreich und Prof. Von Storch kann die Methode sicher gut erklären. Was mich damals aufgestoßen hat ist die 2 Sigma Annahme für die natürliche Variabilität und der durchaus kurze Zeitraum in dem das Signal außerhalb dieser 2 Sigma Grenzen war. Denn bei großen Datenreihen ist 2 Sigma so eine Sache. Wartet man nur lange genug tritt auch mal 2.1 Sigma ein. Ich habe das schon immer mal gefragt, aber nie eine befriedigende Antwort erhalten. Variabilität liegen und das auch noch unumstritten sei, hat mich jetzt einfach verwundert, weil es bedeutet, dass das Argument 3 im Lehrbuch von Latif naturwissenschaftlich obsolet ist. Wenn ich von den Facleuten der Klimazwiebel eine schlüssige Antwort bekommen würde. Aber eben nur zu dem konkreten Fall. Mir geht es nur um diese konkrete Argument und nicht um Attribution im Allgemeinen. Klimasimulations und Hotspot oder andere Diskussionen interessieren mich da gerade nicht. Variabilität raten, abschätzen oder am Besten kennen. Dafür leistet aber doch ein Paper wie Esper et al. seinen Beitrag oder nicht. Nur ganz schnell. Hegerl 1996 wäre dies hier das eigentlich für jeden verfügbar sein sollte. Latif nennt Hotspots als Attributionsargument? Erscheint mir reichlich merkwürdig, da Hotspots bei jeder Art von Erwärmung auftreten. Kann es sein, dass er vielleicht von der Abkühlung der Stratosphäre spricht? Erschiene mir zur Unterscheidung sinnvoller. Wie auch immer, ich finde die Frage, ob die Größe der jüngsten Erwärmung mit natürlichen Klimaschwankungen vergleichbar sei, für nicht entscheidend (und nebenbei: Esper kann dies als lokale Studie nicht beantworten). In der von mir zitierten Antwort des IPCC kommt gut zum Ausdruck, dass nicht ein einzelnes Argument, sondern die Summe der Attributionen das Urteil prägt. Diese Frage auf einen Vergleich der jüngeren Erwärmung mit früheren Erwärmungen zu reduzieren, beinhaltet einen riesigen Informationsverlust, weil man sich nur auf Temperaturdaten zurückzieht. Aber die Klimaforschung weiß doch heute viel mehr, wir wissen z.B. für die letzten 30 Jahre recht genau, wie sich natürliche Antriebe wie solare Aktivität, Vulkanismus oder ENSO entwickelt haben. Auch wenn die Ursachen von Klimaschwankungen in der ferneren Vergangenheit eher unbekannt sind, wir wissen zumindest, dass die genannten drei Ursachen natürlicher Variabilität die jüngere Erwärmung nicht erklären können. Ich finde, Eduardo hat sehr interessante Gedanken in seinem Beitrag vorgebracht, die eine Diskussion verdienen. Die ganze Diskussion dreht sich bislang um eine Randbemerkung. Ich meine, Eduardo hat es verdient, dass man seine Hauptthesen diskutiert. Ich würde dies gerne tun, möchte aber nicht alleine bleiben. Eduardo wirft die Frage auf, ob Espers Arbeit geeignet ist, die Qualität von Klimasimulationen prüfen. Wenn ich Eduardo richtig verstanden habe, ist für ihn das Glas halb leer, für mich eher halb voll oder sogar etwas mehr. Mir ist auch noch nicht klar, wie das Pferd aufgezäumt wird: Ich hatte Espers Arbeit so verstanden, als wären Ergebnisse von Klimasimulationen ein Argument für die Güte von Espers Rekonstruktion. Bei Eduardo erscheint es so, als benutzte er Espers Rekonstruktion zur Abschätzung der Güte der Simulationen. Wir haben hier mit Eduardo einen Koautor von Esper als Diskussionsteilnehmer, eine tolle Gelegenheit, das Paper zu diskutieren, und wir verschwenden diese Chance und reden lieber über tralala wie 2°-Ziel und abstrakte Skeptikerlogik. There is some confusion here. Internal, natural and anthropogenic variability are technical terms, and sometimes there are not clearly explained for wider audiences. Probably we will need a longer explanatory text. I would have problems if we were discussing about genetics. The internal temperature variability -that is the unforced variability cannot in principle be known. We dont have a planet without forcings, so it has to be estimated from control simulations- simulations where the forcings are kept constant. The way forward is the same as in other branch of science. Climate models have made predictions, for instance the development of the global temp for the next 20,30,40, years. These predictions are a range that includes all possible sources of variability (forced and internal). Once the observed temps deviate from this range we have a falsification. Critically important, a theory to replace GHG as source for the recent warming has to be design as well. a theory that makes predictions and explains observations quantitatively. This alternative theory does not exist yet. By this I mean that assertions like: recovery from the LIA, or this or that . Oscillations , are not theories. They don ake predictions and dont use physical mechanisms to explain observations. There is some truth in this , I think, although ' we cant explain it' is a bit too exaggerated. Model simulations do produce a MWP. It can be done quite easily. Just drive the model with a stronger sun in that period. Whether or not, this looks like the real MWP is debatable, because the proxy information about that time is fragmentary. Das heißt, dass Hegerl et al zwei Definitionen von natürlichen Variabilität benutzen: Die erste Definition müsste man besser als interne Variabilität bezeichnen: die Temperaturschwankungen in einer Kontrolsimulation, wo das Forcing konstant gehalten wird. Die interne Variabilität ist ausschließlich durch die Nicht-linearitäten verursacht und tritt auch auf, wenn das Forcing, z.B. GHG oder Sonne, konstant bleibt. Ein Beispiel davon wäre ENSO. Die interne Variabiltät lässt sich nicht aus Beobachtungen direkt ableiten, da die externen Forcings theoretisch immer Temperaturschwankungen verursachen. Die zweite Definition, die von Hegerl et al benutzt wird, ist die interne Variabilität plus die Variabilität die im 20. Jahhundert von natürlichen externen Faktoren verursacht worden ist. Das heisst, in keiner von diesen Definitionen wird den Effekt des orbitalen Forcings, oder den der Bewegung der Kontinente, oder ähnlicher langfristigerer Faktoren, miteinbezogen. Diese Faktoren sind für die Attribution im Prinzip nicht relevant. Sie verursachen Temperaturschwankungen auf anderen Zeitskalen. Hegerl et al sagt in der Zusammenfassung explizit, dass ihre Analyse auf 20- und 30-jährigen Trends angewandt wird. Von daher, trägt Esper et al nicht zur Attributionsfrage bei. Vielleicht sehen Sie nun deutlicher den Sinn meines Beitrages. Um sagen zu können, ob der rezente Temperaturanstieg anthropogen ist , braucht man nicht zurück in die Vergangenheit zu schauen, sondern man braucht zu verstehen, was im heutigen Klima vonstatten geht. Nun, ich gebe zu, dass die Bezeichnung der unterschiedlichen Variabilität in der Literatur manchmal aus historischen Gründen ziemlich irreführend ist. Danke erstmal für die schnelle Antwort die mein Verständnis der Hegerl-Methode fördert. Ich werde wenn noch ein zwei fragen haben. Laden Sie die Dame doch mal zu einem Gastbeitrag ein. Im Gegensatz zu den Kurvenfits von Lean et al, finde ich diese Methode viel spannender. eine Verständnisfrage loswerden zur Methode von Hegerl et al. Da hat mich Herr Zorita jetzt weitergebracht, über meine Schlussfolgerungen muss ich jetzt nachdenken. von mir. Ich habe aus dem Gedächtnis rekapituliert und habe den Vergleich Signatur Solarforcing und CO2 Forcing vor mir. Ist der Hotspot was anderes? Wie auch immer, werde Zuhause nachschauen und nochmal das Latif Buch im Lichte der Erklärungen von Herrn Zorita lesen. P.S. Mit dem "Wir" meinst Du hoffentlich nicht mich, denn ich weiß noch nicht genau wie sich die natürlichen Antriebe in den letzten 30 Jahren entwickelt haben. Wie sind denn die räumlich-zeitlichen Veränderungen der Wolkenbedeckung in den letzten 30 Jahren bekannt? Once the observed temps deviate from this range we have a falsification. What I think we need is a better public communication on this range and it's timings. I don't think so. Not at all. What we need to know is whether our theory is good enough to make attributions and to take decisions, and that's independent on whether we have an alternative theory or not. Moreover, although we don't have an alternative "climate theory" (that I know of), we do have theories to question the measurements on which the models are based, and thus the models themselves. Thanks for your patience and answers. Die Wolkenbedeckung in diesem Kontext ist kein natürlicher Antrieb gesehen sondern Teil der internen Variabilität. Ebenso wie ENSO (siehe Eduardos Beitrag). Oder zielen Sie im Endeffekt auf Svensmark ab? Vielleicht lässt es sich organisieren, aber der zweite Autor in Hegerl et al. ist von Storch..
the decision making process is not where I am in. I could be in even if I wanted, because I dont have the technical expertise. We have, however, to bear in mind that no scientific theory is perfect, and most of the theories that we use for daily decisions are not complete or imperfect, or are have just semi-empirical basis. They are, however, good enough for our purposes. An example: there is no perfect theory of turbulence, and yet we build cars, planes and ships; Newton's theories, gravitation and dynamical laws, are both incomplete, and yet we use them to launch satellites; the knowledge about cancer is not complete, and yet we treat patients with what we think are the best methods. Let alone the realm of economics. It is not known what is the effect and for which mechanisms Quantitative Easing can boost the economy. Economists are discussing it right now and they juggle with alternative theories. Can we say that economic models successfully predict anything ? Yet, some governments apply this technical fix using a lot of money. The interaction between science and decision making involves probabilities , degree of believe and all those murky terms. An Svensmark denke ich da überhaupt nicht. Was bei mir nicht zusammengeht ist folgendes. in den letzten 30 Jahren die natürlichen Antriebe entwickelt haben. dann mache ich folgende Beobachtung. oder ich messe die interne Variabilität unabhängig und gebe sie während der Simulation mit dazu. Und das gilt jetzt nur für lineare Systeme. Bei nichlinearen wird das schwieriger, wenn interne Variabilitäten da sind, die sich aufschaukeln..
nicht ausgeglichen ist, wirkt also als ob ein zusätzliches externes Forcing in diesem Betrachtungszeitraum präsent gewesene wäre. Übrigens zeigen die ISCCP Daten so etwas an für die letzten 30 Jahre, aber die werden von den "wir" erstmal nicht geglaubt, zumindestens kommt das bei mir so an. Wichtig ist, dass Sie das "als ob" für sich richtig würdigen. Das mag jetzt nicht stören, wenn ich ausreichend lange Zeiträume betrachte, da wird es sich schon ausgleichen sagen die "wir" vom Andreas. Ist ein schönes Argument, aber das sollte dann auch gezeigt werden. Ich nun möchte aber gerne sehr speziell wissen, wie und ob die "Detection and Attribution" Methode von Hegerl et al. robust gegen ein nicht ausgeglichenes oder Unbekanntes Raum-zeitliches "cloud radiative forcing" ist, gerade weil Herr Zorita ja sagt, dass man für Attribution die Vergangenheit nicht braucht. Und vor allem auch Warum. zur Variabilität von Hegerl et al. bestätigen. Und Hansen bestimmt ja auch die Klimasensitivität aus Paläo-Daten. Ansonsten erscheint mir 2 Sigma schon recht dünn. Man sollte dann bei kurzen Zeiträumen eher auf höhere Sigmawerte ausweichen. Denn es gibt viele kurze Zeiträume. Das ist jetzt aber ein Bauchgefühl. Ich hätte jetzt gedacht, das passt zu einem Thema wie Esper et al. Wenn nicht dann gerne auch ein Extra-Beitrag. Bei mir kommt die Aussage von Herrn Zorita da so ein bisschen wie ein Armstrong-Effekt an, wenn ein Paper Zweifel am Mainstream Aufkommen läßt, wird schnell beteuert das es keinen Einfluß hat. Nur den Platzhirschen nicht auf die Füße treten, sonst keilen die. Aber das ist nur ein Eindruck. Wie oben schon gesagt, ich freue mich über jeden kompetenten Beitrag zu meiner Frage. Akademisch gesehen wäre es sicher passend den"lead author" zu fragen und zu würdigen. Wie gesagt eine interessante Methode, aber ohne Fragen komme ich damit nicht weiter. Hans means that the detection and attribution problem involves 2 steps: one to show that the recent temperature30-year trend is outside the range of trends possibly caused by internal variability. This would indicate that the random multidecadal 'weather' is unlkely to be responsible for the observed trend. The second step: once this is seen to happen, the external forcings are assumed to be responsible for the trend and are tested one-by-one or in groups (e.g. natural versus anthropogenic as possibly responsible for the trend. Sure, that's obviously the point. Good enough for our purposes. How do we know they are "good enough"? Certainly not because we don't have anything better. Nothing better does not mean good enough. The examples you provide have been checked to work, and very carefully. They didn't launch manned spacecrafts until they tested unmanned ones, etc. So the question remains to be the critique whether it is good enough. And understanding MWP seems to be related. The reasons why Hans cannot log into Klimazwiebel is that he is now in China and that Klimazwiebel seems to be blocked for readers there. I would generally agree with you here. Since we cannot perform controlled experiments with the Earth, it is intrinsically more difficult to test models and hypothesis in climate science. It is also no secret that models are not perfect, and key aspects of the present climate are not well simulated. If models were perfect, they would produce the same climate change when driven by future concentrations of CO2, and they dont. This is where paleoclimate can contribute, and understanding the MWP is a good target - for instance if it was externally forced or the result of internal random variability. Es gibt sicherlich mehrere Gesichstpunkte. Jan Esper ist Dendroklimatologe und betrachtet die Klimasimulationen als eine Bestaetigung der Rekonstruktionen. Fuer mich ist es eher umgekehrt. Beide Methoden unterstuetzen sich gegenseitig, da sie voellig unabhaengig von einander sind. Bis jetzt lag der Fokus auf dem Einfluss von Vulkanismus oder der solaren Einstrahlung, die im letzten Millennium imer noch sehr ungewiss sind, was der Vergleich zwischen Rekonstruktionen und Simulationen beeintraechtigt. Dagegen ist das orbitale Forcing sehr genau bekannt. Auf diesen Zeitskalen sollten beide Methoden uebereinstimmen. Wenn nicht, ist die "Ausrede", dass das in den Modellen eingesetzte Forcing falsch sein koennte, nicht mehr moeglich. danke für ihre Antwort. Ihr Beitrag war für mich auch deshalb so hochinteressant, weil Sie eine Perspektive aufzeigen, die ich dem Paper so nicht entnommen habe. Ich als Laie bin beeindruckt, dass bei Simulationen über diese Zeiträume Trends ermittelt können, die der Realität doch schon sehr nahe kommen. Sie verweisen auf regionale Unterschiede der beiden verwendeten Modelle. Ist es nicht etwas viel verlangt, dass bei diesen Zeiträumen auch auf regionaler Ebene übereinstimmende Ergebnisse herauskommen? Können die Modelle z.B. auch langsame Feedbacks gut erfassen? Und: Wenn der Ort, wo man die Baumringe ausgewertet hat, heute ein guter Stellvertreter für eine größere Region ist, muss das dann auch für die letzten 2000 Jahre gelten? Und jetzt bin ich mal ganz neugierig: Können Sie einen Wert für den Abkühlungstrend angeben, den die Modelle für die gesamte nördliche Hemisphäre liefern? Man könnte diesen ja verwenden um mal zu schauen, wie gut Manns Hockeystick den langfristigen Trend widerspiegelt. "The effect of anthropogenic CO2 can only be ascertained by comparing two situations that only differ in their CO2concentrations, but which are otherwise equal." Eli Rabett, this is certainly not "nonsense" but proof that you failed to think what the author meant. You can do statistics with lots of data, but the result depends on (often tacit) assumptions (such as: that you know all drivers), and a residual doubt remains, always. You missed the core concept of statistical modeling and deciding, and disregarded the inherent uncertainty. Eduardo referred to experimental deciding. But as you wrote, the four hundred years between 0 and 400 AD. disproofs the oscillatory interpretation. Why would one want to ignore those data ? Furthermore, there is a quite plausible explanation for a millennial linear trend: the orbital forcing. What would be the explanation for a cyclic behaviour? which are the mechanisms causing that oscillation ? Why should be a cyclic behaviour in the first place ? Nein, nicht unbedingt. Aber der Vergleich, den ich ansprach, bezog sich auf den zwei Trendmustern, die von den Modellen simuliert werden. Es ist plausibel zu denken, dass gerade auf größeren die Übereinstimmung auch stärker sein sollte, denn das kleinräumige Rauschen ausgeglichen wird. Der simulierte orbitale Trend der Nordhemisphärischen Jahrestemperatur beträgt 0.05 K/Tausend Jahre. Man muss aber berücksichtigen, dass wenn die Zeitskalen kleiner werden, auch andere Antriebe einen langfristigen Trend aufweisen können. Auch ist es zweifelhaft, ob die Baumringdicke die langfristigen Trends wiedergeben können- Im Hockeystick sind fast alle Serien Baumringdickmessungen. Jan Esper meint, eher nicht , und deswegen braucht man Dichtemessungen.